All Juicy Burgers Restaurants® are exciting franchise business opportunities backed by a successful organization. Our support includes real estate assistance, dynamic marketing programs and national buying power. In addition, we provide a business system proven to be successful along with comprehensive management training programs. Franchise owners also have many advantages of continuing support in all facets of the business and the opportunity for multi-unit development. With Juicy Burgers the franchise owner has a superior opportunity to own a restaurant with minimal investment capital and compared to other franchises, could be as little as one-third the financial commitment allowing you to open at 3:1 ratio of investment. At Juicy Burgers Restaurants it’s all about the hamburgers. They’re always made fresh and to order – right in front of you. All you have to do is taste one of our hot fresh custom hamburgers and you’ll be hooked. There is a huge difference between our hot fresh custom hamburgers and traditional hamburgers that are made by other chains and restaurants. In fact, when you stop by one of our restaurants just ask for the manager and we’ll gladly share our various brand hamburgers with you – whatever hamburger you want to create; it’s on our menu. 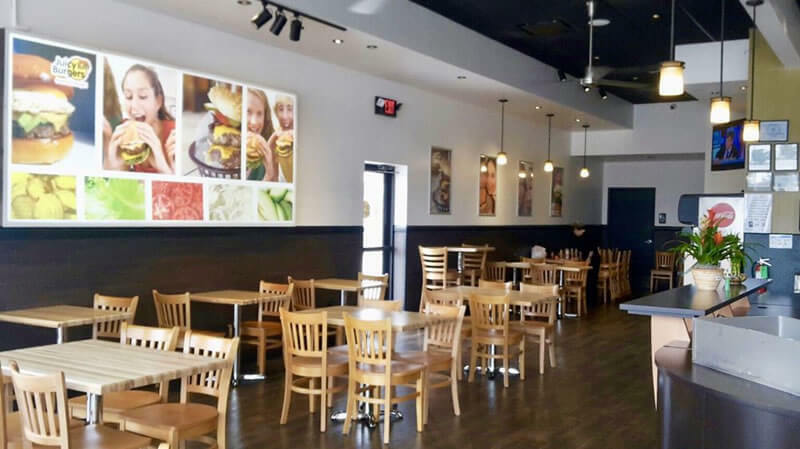 Juicy Burgers is a fast-casual restaurant our customers love. We expect our brand to eventually be known as the best hamburger in the country, that’s why we’re called America’s Burger! Our Hamburgers-– At Juicy Burgers Restaurants, we never do things the boring way; we never will. Our hamburgers are “hot, fresh, and custom”. They are very tasty and flavorful and slightly addicting. Our hamburgers are made all day long in our restaurants, food trucks and retail stores so they’re always hot and fresh—you can even see them being made. They are custom designed and loaded with the freshest ingredients and sauces at our customers’ request. Our menu toppings are proprietary and each hamburger is custom created right in front of you. With our unique toppings and sauces, the combinations of your custom hamburger is virtually endless. All Juicy Burgers Restaurants® are exciting franchise business opportunities backed by a successful organization. Our support includes real estate assistance, dynamic marketing programs and national buying power. In addition, we provide a business system proven to be successful along with comprehensive management training programs. Franchise owners also have the advantage of continuing support in all facets of the business and the opportunity for multi-unit development. One component of Juicy Burger’s® overall growth strategy is non-traditional development. Prepared foods are booming in convenience stores and Juicy Burgers is your perfect partner. C-Store QSR sales of prepared foods have grown nearly 8%, and the amount of menu offerings have increased by 21%—a significant surge unseen in restaurants before. Our customers are also increasingly visiting C-Stores solely to purchase prepared fresh foods, which may be contributing to greater brand loyalty and as a QSR, Juicy Burgers compliments your C-Store you realize higher sales. Now more than ever, C-Stores need to offer high quality food if they want to compete. Juicy Burgers delivers that high quality fresh food. Customers have nearly limitless options for where to eat, and for C-Stores to keep up, they need to be offering fresh quality food that customers crave. Juicy Burgers can be set in a small footprint within your C-Store. Juicy Burgers QSR inside your C-Store is a win-win for success! 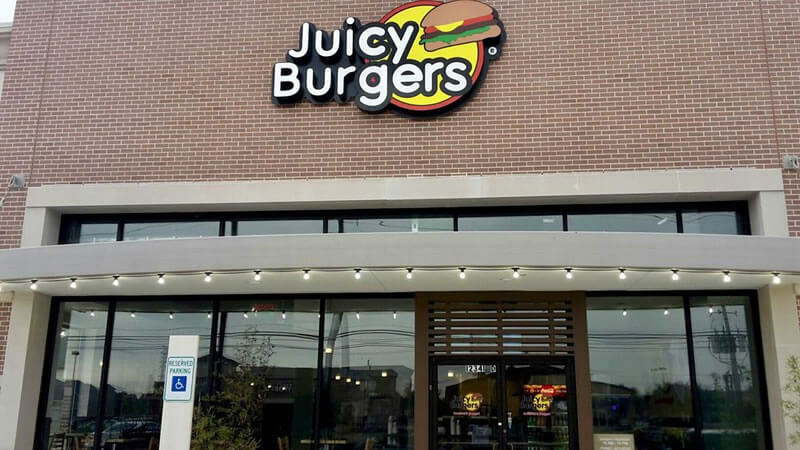 Juicy Burgers is a 1,500 (+/- 300) square foot QSR fast casual hand crafted burger eatery restaurant concept with in-door and out-door seating designed to target the new generation of emerging diners throughout the United States and worldwide. A new eating occasion — “a savoring experience” — is developing among foodies. “Service styles, technology, freshness, distinctive flavors and foodie narratives” define this more mainstream experience. The use of descriptions, like grass fed beef, heirloom tomatoes or hand crafted is all examples of this more sustainable dining experience. The interior of each Juicy Burgers site gives off an urban modern style QSR restaurant. Warm colored materials such as branding spaces, social media wall and lite hard woods will flow throughout and will be accented with modern-industrial touches such as stainless steel and pendant lighting. Accent colored walls will help brighten up each space and provide the signature “fun” and "WOW" feel that will be part of each Juicy Burgers experience. 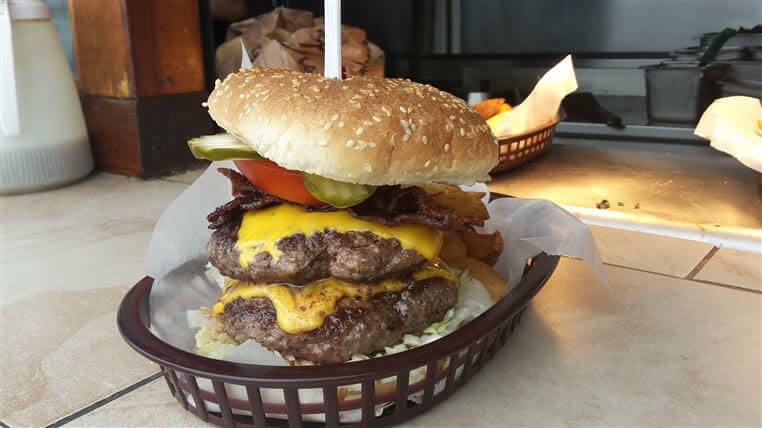 A media wall allows customers to immediately share Juicy Burgers on social media. 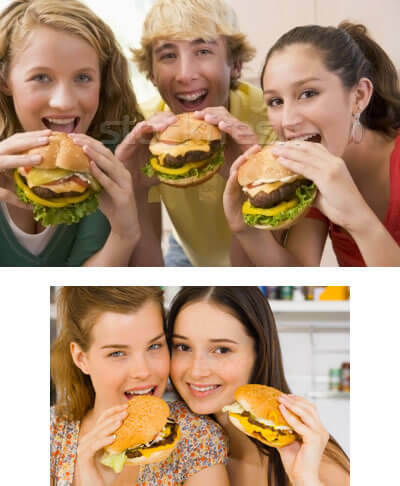 Juicy Burgers is offering a unique opportunity to franchise with our highly popular brand in the quick-serve restaurant (“QSR”) industry. 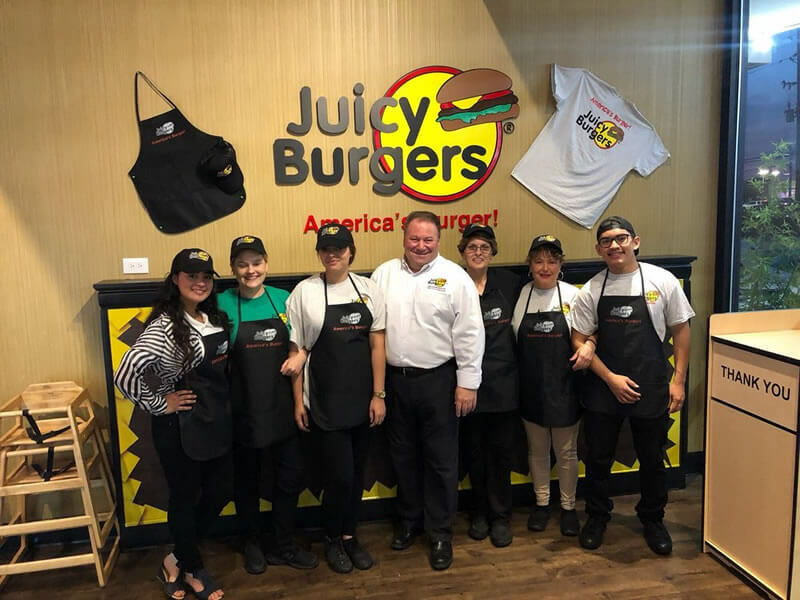 The company’s emphasis on operational efficiency and franchisee-focused value innovation is leading Juicy Burgers to become one of the most respected brands in the industry. The company is looking to establish relationships with single unit and select multi-unit franchise operators of non-competitive brands to franchise our brand in emerging and core markets. Most if not all of our franchisees have no food or restaurant experience and it's not necessary as our program can support you in either a owner-operator or manager-operator scenario. Our focus is to optimize franchise profitability and return on invested capital. Many existing QSR competitor locations can be easily converted into Juicy Burgers locations, providing the opportunity for franchisees to realize lower real estate and construction costs. We provide our franchisees with comprehensive support for site selection, lease negotiation, restaurant development and construction, hiring, training, and field operations. We are looking for candidates to franchise with us that have energy, enthusiasm and a desire to help grow the brand. Restaurant experience is a plus, but not necessary. Request Information and our Qualification Form will be sent to you. Please call Juicy Burgers directly at 1-855-Try-JuicyBurgers. Juicy Burgers Restaurants is currently accepting inquiries from the following states: Alabama, Alaska, Arizona, Arkansas, Colorado, Connecticut, Delaware, Florida, Georgia, Idaho, Illinois, Iowa, Kansas, Kentucky, Louisiana, Maine, Massachusetts, Mississippi, Missouri, Montana, Nebraska, Nevada, New Hampshire, New Jersey, New Mexico, North Carolina, Ohio, Oklahoma, Pennsylvania, South Carolina, Tennessee, Texas, Utah, Vermont, Washington, D.C., West Virginia, Wyoming.